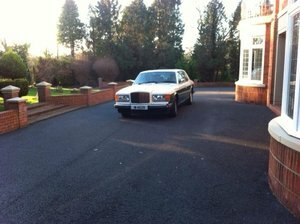 6,750cc V8, 3-sp auto 104,800 miles MOT until July An opportunity to own a Bentley in the marque’s centerery year. Finished in Windsor blue metallic paint, with champagne hide interior, light blue piping and lambswool rugs. Registered in March 1988, owned by me since July 2012, and maintained by expert specialist Colbrook in Stilton, with MOT advisories recently dealt with. The car has the twin headlamps from later examples retro-fitted, as well as 17-inch alloys from 1994 – the original car was sold with 15-inch wheels – and with the 2016 paint respray, this Turbo R has the appearance and feel of a much younger vehicle. The Avon Turbospeed tyres on the 17-inch wheels are less expensive to replace than those used on the original 15-inch wheels, although these have plenty of life left in them and will be good for a few more years. The alloy wheels were restored in spring 2018, and the wood door cappings and dashboard veneer are in perfect condition. Bodywork is excellent, with no visible rust, all carpets and hide are in very good condition, and the car has its original Rolls-Royce/Bentley tool kit. Automatic climate control works, with strong air conditioning. Electric windows, door mirrors and electric front seat adjustment all work perfectly. It has the original Blaupunkt radio/cassette player, with automatic electric aerial. The car also has a period carphone in the centre console storage compartment, although it’s for looks and isn’t connected. The Turbo R has a complete history over the last 30 years, and was maintained by Colbrook before my purchase in 2012. I have also kept invoices for work done since then. It has been reliable, and is a very comfortable car for long distances. It has been stored at Colbrook during the winter for every year of my ownership. Premium weatherproof tailored car cover, which cost £400, included in sale. Runner up in the 1980s class in the 2018 Boston Classic Car Show, and subject of a very positive write-up in Classic Car Weekly in November. A rare opportunity to find a Bentley of this era in such good condition, and no doubt an appreciating classic.